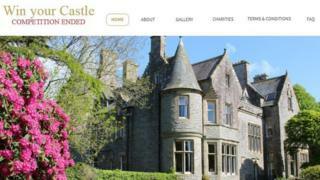 A woman has been rapped by the advertising watchdog for offering a Scottish castle as a raffle prize - but giving the winner a cash prize instead.Susan DeVere set up the contest after she failed to sell Orchardton Castle, near Auchencairn, Kirkcudbrightshire.However, cash giveaways were offered when ticket sales were too low.The Advertising Standards Authority (ASA) said the competition was not "administered fairly" - a ruling disputed by Mrs DeVere.She said she made the possibility of a cash prize clear. Tickets costing Sums of ?65,000, ?7,000 and ?5,000 were handed out in June last year.One person complained the raffle had been administered unfairly because the prize had been changed to a cash amount. Built in the 1880s, the 17-bedroom property had been valued at between ?1.5m and ?2.5m and comes with five acres of land and views across the Solway Firth.Mrs DeVere told the ASA that all property competitions were run in the same way and the castle could not be awarded if there were not enough entries received to clear the mortgage.She said it was made clear from the beginning that if not enough entries were received, the property would not be awarded and a cash prize would be offered instead.Mrs DeVere added that after the prize draw had taken place the winner was offered a share of the property and a chance to run a business there had they wanted to, which was a goodwill offer unconnected to the competition. The winner chose to accept the cash prize. The ASA said the complainant had entered the promotion in the hope of winning the castle.It said: "We understood that at the end of the competition three cash prizes were awarded at the value of ?65,000, ?7,000 and ?5,000 instead of the advertised prize, because the minimum number of entries had not been reached, and that the advertiser had offered the winner a share of the property. "However, we considered that a share of the property or any cash alternative that was less than the value of the property, were not reasonable equivalents to the prize as advertised. "Because neither the advertised prize nor a reasonable alternative had been awarded, we concluded that the promotion had not been administered fairly and was in breach of the code. "Mrs DeVere said in a statement: "It is fair enough to challenge a competition or any unfairness and it should have taken the ASA a heartbeat to look at our site and see that from the beginning everything was spelled out, including that a cash prize to the value of tickets (sold could be substituted). Examples were given (of what) would happen if enough entries were not received. "In a further post on the Win Your Castle website, Mrs DeVere blamed the raffle failure on companies such as Eventbrite and Paypal, which she claimed withdrew their support.She wrote: "There are many inconsistencies in the ASA investigation. I answered all their questions openly and I believe that I ran the most transparent competition online. "There was nothing wrong with my promotion, I especially made it clear that if the target was not met that the money that came in from the entries would be used for prizes and charitable donations. "She said she intends to appeal against the ASA's ruling.